Join the Facebook group where I share my favorite cooking & lunch things. Join my VIP Customer Facebook group. Follow this page to read about parenting and autism. Ranch dip and ranch dressing have become classic flavors that a lot of us could not picture life without But do you really need to buy it in a bottle? I don't think so. It's so easy to make from just ingredients that you probably already have in your pantry & fridge, there's really no need to ever buy it again! This is a light and tangy sour cream & yogurt based Ranch Dressing recipe. A lot of ranch recipes call for mayonnaise. Now don't get me wrong - I LOVE mayo. But not in ranch. I want my ranch dip to be light and tangy. And by light I don't mean low fat - you'll notice that I'm using full fat sour cream, yogurt, and milk - but I mean not oily, not heavy, not that richer flavor that comes with mayo. I just prefer it this way. But honestly you could take this basic blend of seasonings and add it to whatever combination of cream/yogurt/mayo/milk/etc. that you like. It will taste great. This was a quick lunch salad I just threw together. Cooked barley, olive oil, tomatoes, basil, garlic, salt and pepper. Simple and yummy. And the barley makes it really filling. 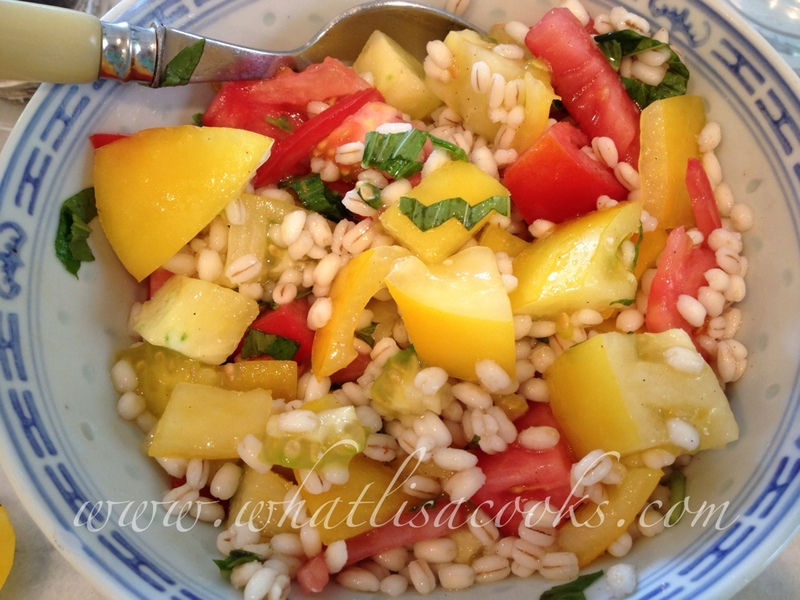 I can - and will (and maybe already have) go on and on about summer tomatoes. Much of the country is probably all tomatoed out by now - but here in the Pacific Northwest we are just kicking it into gear. We have had some smaller tomatoes ripe for the last month, but it's only in the last week or so that I am getting the really good, big slicing tomatoes. 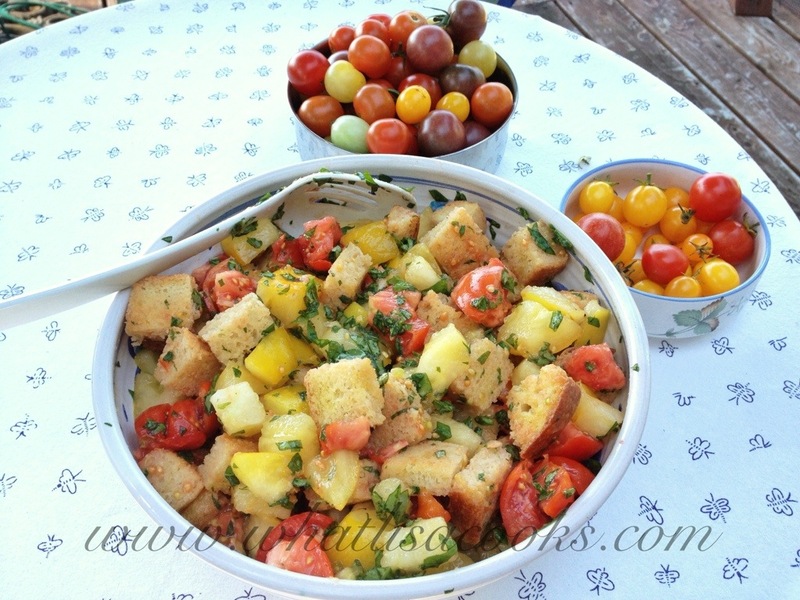 Tomato bread salad is one of my very favorite things to make with the freshest and juiciest summer tomatoes. I can't think of a better way to show off and savor the flavors of these ripe off the vine tomatoes. The first step is to make homemade garlic croutons. It's easier than it sounds. For this one - I used a loaf of crusty homemade white bread. I cut into thick slices and toast in a 375 - 400 degree oven until lightly browned. Then I take whole cloves of garlic and rub the bread - the garlic melts and disintegrates into the bread, and the bread gets a wonderful garlicky flavor. Then I cut the slices of bread into cubes, toss with some olive oil and salt, and spread them back on the cookie sheet to toast a little more until really crunchy and all over golden brown. While the bread is toasting - cut tomatoes into cubes. I like to keep the pieces big so they hold their texture and shape as the salad is tossed. And I love to be able to use a few different kinds or colors of tomatoes. Chop up a bunch of fresh basil, and finely dice some more fresh garlic. Toss the tomatoes, basil and garlic with some good olive oil and a little salt. Quanties really depend on personal preference - I like a nice balance of tomatoes to bread, and I like a lot of garlic and a pretty good amount of salt. You can also add a little finely diced red onion if you like. 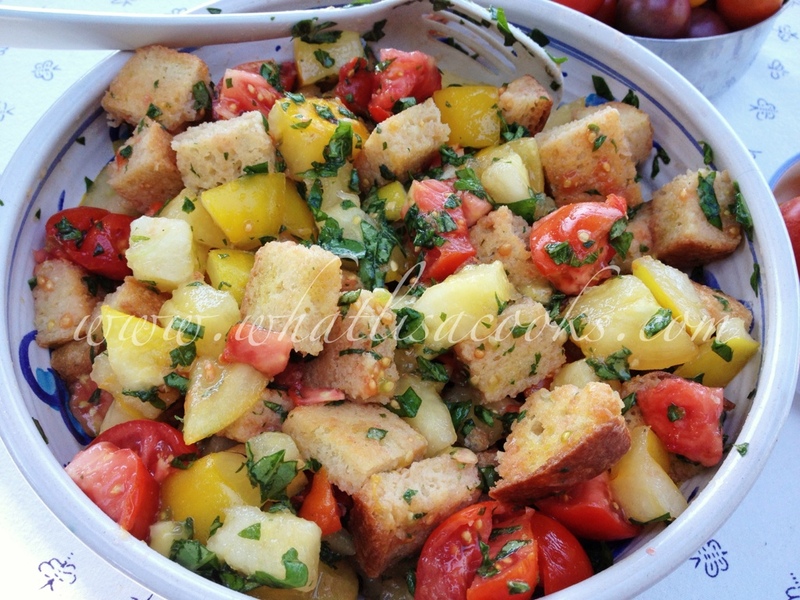 When the croutons are done and a little cooled, toss with the tomato & basil mixture. Taste for seasoning and maybe add a little more salt. Then let it sit for a little while, stirring occasionally to make sure all the juices get mixed in. The juice comes out of the tomatoes and soaks into the croutons. It's just perfect when the croutons are mostly soaked, but still have just a bit of crunch left. This is just so good. Oh, this was the perfect summer salad. And super easy (do I say that about everything?). Take all the veggies in your fridge, chop in food processor, add pre-cooked lentils, vinaigrette, and seasoning. So easy. This one had broccoli, onion, purple carrots, basil, yellow squash, celery. You can cook your own lentils and let them cool, or buy pre-cooked lentils. Trader Joes has cooked lentils. If you cook them, just make sure they are a lentil that stays somewhat firm when cooked. Sometimes I make vinaigrette, but I was in a hurry so I just used bottled champagne dressing, garlic salt, pepper, and an organic no salt seasoning blend that I get at Costco. Poor, neglected little food blog. We have been eating, but not a whole lot of interesting cooking has been going on. More of the old staples - omlettes, big salads, etc. Summer is a busy time - vacations, twins birthdays, holidays, boating - no time to cook! But I have been making some interesting salads lately that I will share with you. 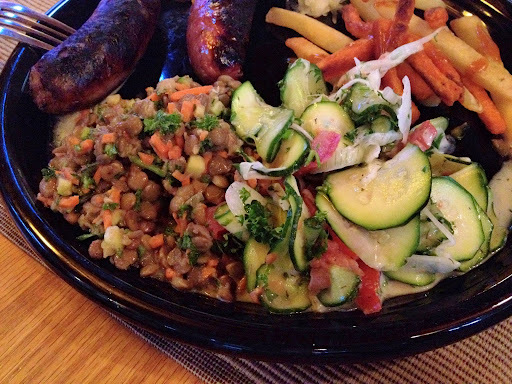 The first was a German Lentil Salad. You'll find the original recipe linked here. I followed it somewhat, although I don't measure ingredients. The recipe does not specify the type of mustard or the type of vinegar, so I used Dijon mustard and apple cider vinegar, because they are what I had. And, as I'm re-reading it I realize that I forgot the garlic - that would have been good. And I added a half of a diced raw zucchini. It was tasty - it's a little different at first, but the more you eat the more you like it. I will definitely be making this again. The next recipe was for German Cucumber Salad. I actually found quite a few versions of this, but I liked this one because it also had onion and tomatoes. I did this with one cucumber and one zucchini - I've found that zucchini behaves very well in most cucumber recipes, and I like that it's a bit more substantial. I substituted nonfat plain greek yogurt instead of the sour cream, to keep it lighter. And I used lemon juice instead of vinegar - because the only vinegar I had in the house was apple cider and I didn't think that sounded good in this one. And a lot more than a tablespoon of fresh parsley. And I used dry dill - fresh would have been really good, but no time for a trip to the store. I used my mandolin to slice the cucumbers, zucchini and onion very thin, and let it all marinate for a couple hours. Very yummy - the kind of thing I really like! These two were both pleasant surprises - and they went very well together. The other two salads I have been making lately are a Quinoa Salad and a Kale Salad. I'm a bit obsessed with these - my poor husband is probably getting tired of them. They are each excellent on their own, and really good mixed together. o stir in a bunch of good, flavorful olive oil. I really have no idea how much – I just keep adding a little at a time and stirring into the quinoa until I like the consistency. I like an olive oil with some good flavor – maybe a better olive oil than you would use for just cooking. o Same with fresh lemon juice – lots of it. o I basically just keep adding the oil, juice, s & p a little at a time until I like the flavor. · Taste again and season more if you like. o I did one last week very simple with just diced cucumber and lots of fresh chopped parsley. o I’ve done diced tomato and diced raw zucchini. o Most recently – I used the Trader Joe’s “Healthy 8 Chopped Veggies” – a mix of 8 veggies, all pre-chopped in perfect size pieces. This made the salad so easy! · Clean, dry, stemmed, chopped Kale. TJ’s has bags of it – pre-washed and chopped. If I use this, I go through and pick out the thicker stem pieces, because they don’t de-stem it and I don’t like to eat the thick stems in a raw salad. o Garlic (or last week I did it with a roasted garlic hummus from TJ’s, and didn’t add extra garlic). o Hold off on adding any extra salt until you’ve tasted it – the hummus and the soy/braggs might be enough salt. 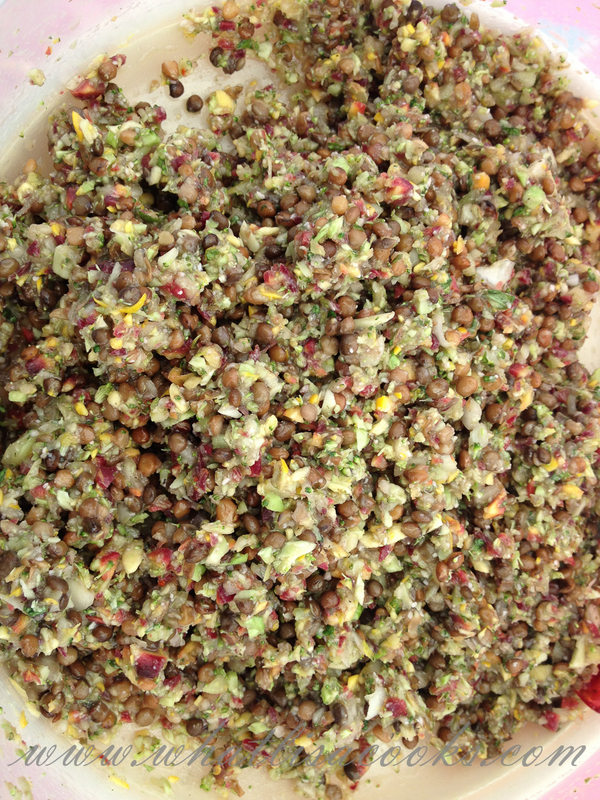 o Mix that all together well and adjust to taste – I like mine pretty lemony and garlicky. 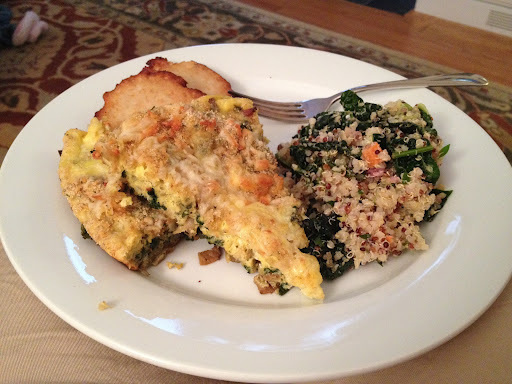 · Toss the kale salad with the dressing – and be pretty rough with it. Unlike lettuce where you want to be gentle, with kale you want to bruise it up a bit and help break down the thick fibers a bit. · Let it sit for a while – at least ½ hr.